AMD surged more than 4% after a price target increase from Rosenball on Thursday. The stock is currently at its highest level in more than a decade. Shares of AMD surged more than 4% Thursday to hit $21.94, their highest price since December 2006.Thursday's move came shortly after Rosenblatt Securities raised its price target on AMD shares to $30 from $27, citing competitor Intel's slow move to 10 nanometer chips. The firm's target is the highest on the Street and 66% above analysts' average of $18, according to Bloomberg. 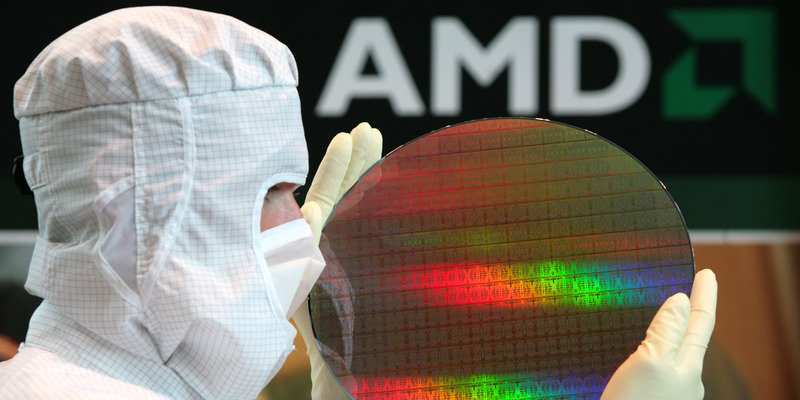 "AMD never planned or expected Intel to have 10nm delays in their own product planning from years' back and acknowledges that a historical window of opportunity has opened," analyst Hans Mosesmann said in a note to clients, per CNBC. The insight comes after hosting institutional investor meetings with the company's CFO and head of investor relations.AMD will roll out its 7 nanometer chips later this year, even smaller than Intel's 10 nanometer chips —a size AMD is already producing — which will come in 2019, the company has said.Thursday's surge also follows a stellar earnings report from AMD, which easily topped Wall Street's expectations and sent the stock up more than 9%.Shares of AMD have climbed 98% this year, easily outperforming the benchmark S&P 500 index's 6% gain. 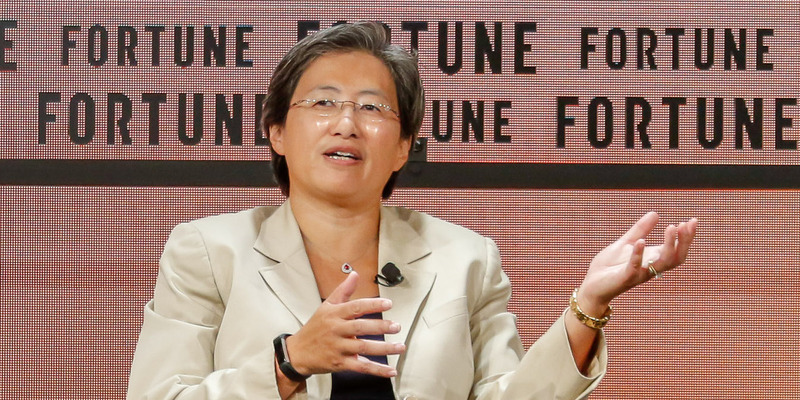 AMD on Sunday announced a new graphics card aimed at data center users. The stock surged in trading Monday, hitting its highest price in over a decade. Shares of AMD surged as much as 12% Monday, hitting an 11-year high of $27.30, after the company on Sunday announced a new high-performance graphics card for data centers. It later pared some of those gains and was trading up about 7%. The Radeon Pro V340 card is intended to help speed up CAD software, rendering, and virtualization for enterprise users, and has 32 GB of memory. it should be available by the fourth quarter, the company said. "As the flagship of our new Radeon Pro V-series product line, the Radeon Pro V340 graphics card employs advanced security features and helps to cost effectively deliver and accelerate modern visualization workloads from the datacenter,” Ogi Brkic, general manager of Radeon Pro at AMD, said in a press release. AMD has been on a hot streak since its second-quarter earnings beat in July, which sent shares surging more than 6%. An upgrade from Rosenblatt Securities last week further catalyzed the rally that has helped the chip maker post seven straight days of gains, it's longest streak in about two years. Shares of AMD are now up more than 121% in the past year, but Wall Street thinks the gains may be short-lived. Analysts polled by Bloomberg have an average price target of $18 a share — 29% below where they're currently trading. And AMD's SVP James Anderson just unloaded 17.6% of his shares. 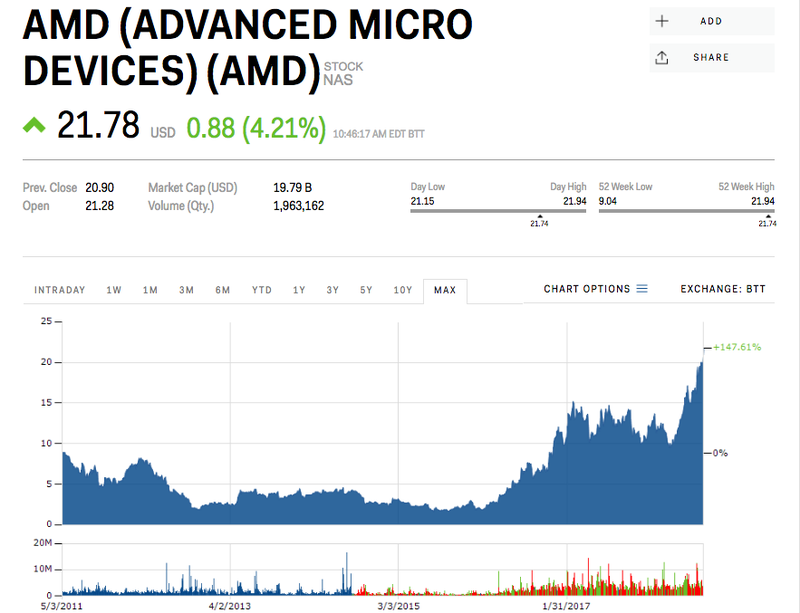 Advanced Micro Devices, Inc. (NASDAQ:AMD) SVP James Robert Anderson sold 150,000 shares of the stock in a transaction that occurred on Wednesday, August 22nd. The stock was sold at an average price of $20.38, for a total value of $3,057,000.00. Following the sale, the senior vice president now owns 701,338 shares in the company, valued at $14,293,268.44. If he would have waited till Thursday he would have made $234000.00 dollars more on the transaction. But since the Stock Market is such a gamble, If he would have waited til Thursday he could have lost more than what he sold it for on Wednesday.